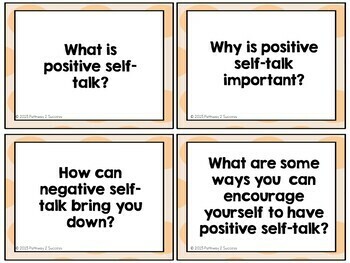 Use these 116 task cards to focus on improving self-esteem, confidence building, and encouraging positive thinking skills. They can be used in small groups, 1:1 for intensive instruction, or even in a whole class to help focus on building a positive community of learners. Each section of task cards also includes a cover sheet that highlights the objectives for each section. 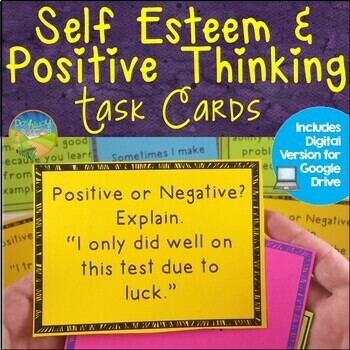 These task cards are aimed to help a variety of age and grade levels, targeting students who need support building their confidence, self-esteem, and ability to think more positively. The cards would be great for students struggling with anxiety, depression, or other disabilities. 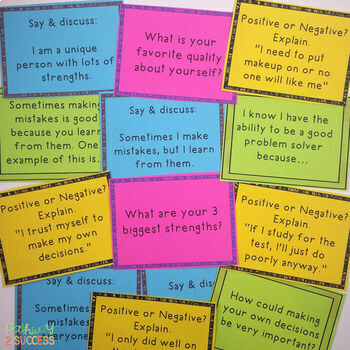 Students will define self-esteem, explain how self-esteem is connected to their lives, identify personal strengths, explain and practice positive self-talk, turn negative thinking into more positive thinking, and more. 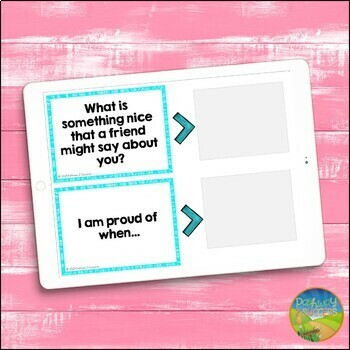 The goal is that these task cards can help your students develop a stronger sense of self-confidence, allowing them to become more independent and reach their individual potentials along the way. This is a bundle focused on helping students build self-confidence, increase positive thinking skills, and reduce anxiety and worrying. The materials are a blend of printable no-prep worksheets, activities, lessons, and task cards. It focuses on building self-esteem and confidence, creating positive thinking skills, and helping students manage anxiety and worrying. This is a huge mega bundle with over 470 pages focusing on critical social and emotional skills, including emotional management, coping with anger and anxiety, perspective-taking skills, developing smart goals, improving confidence, executive functioning skills, self-regulation, positive thinking, and more.